New Business Cards are Coming! 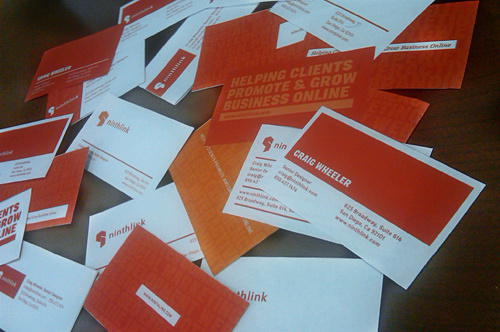 After some discussion and tons of iterations, Ninthlink has new business cards fresh off the press and scheduled to arrive early next week. This pile of mock-ups is a tiny peek into the process it takes to come up with the end result. Craig joined the Ninthlink team in 2002 as an intern before graduating from SDSU in 2003. For the last eight years he's been wrangling interface designs, falling in love with various typefaces, and enjoying urban color palettes found on his bike ride to and from work. He keeps the creative juices charged by spending time in the ocean and mountains and a steady routine of yoga and meditation.